TGIF everyone! Today I'm back to share Week 5 of my Project Life. 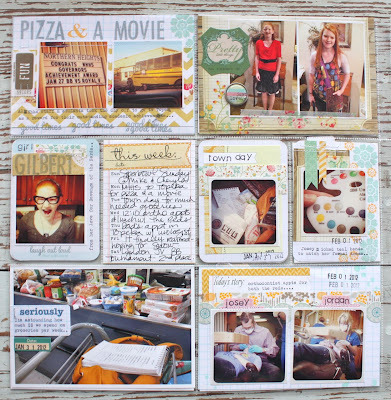 You can view my Week 5 PIP post for product links and inspiration for this week's layout. Here's my 2 page spread. The left page of my layout. Lots of white backgrounds this week with fresh, flowery embellishments which reminded me that this week's layout reflects a lot of my card making style. I used my new My Mind's Eye Miss Caroline line of papers & stamps....love the mixy match look that I can get from little 6 x6 paper pads. The right page of my layout. 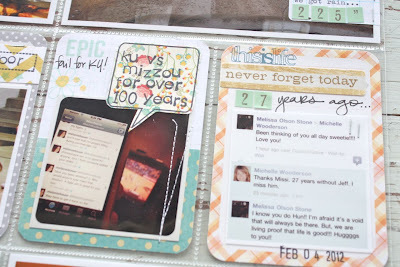 I got lots of use of my new Studio Calico Epic and Awesome stamps. Just perfect for Project Life. 19 photos were used this week! So awesome that I can squeeze them all into a 2 page layout. Here we go with the 3 x 4 journaling inserts. This first one just cracks me up. We lovingly refer to Jordan and 3 of her best friends as "the dorks". Four little misfits that formed the best of friendships. They are quite entertaining when they all get together. Here's Jordy in this photo posing as Girl Gilbert....after her love of the movie Revenge of the Nerds. Her nerdy laugh is right on! 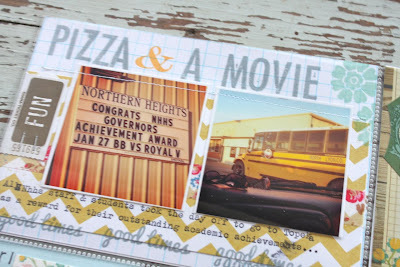 The letter stamps I used this week are from Studio Calico, made by Hero Arts. 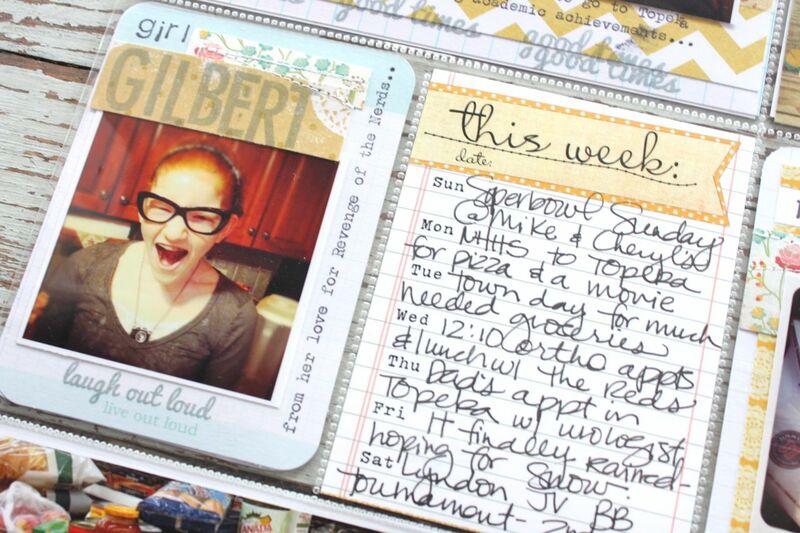 On the right side I made a Week in Review card using Elle's Studio products. I'm trying to incorporate more of my own handwriting. It's so loopy though that I really have to try to write small and contain my loop-de-do's. My favorite inserts of the bunch. These use pretty papers from MME Miss Caroline + little Hero Arts wood letter stamps + a MME stamp set for the flowers on the right insert. I'm making an effort to start using my stamps more in my Project Life pages. These two inserts reflect my day in town...I live in the country, so I try to make my trips to town very productive. Then I usually get the *town headache* and rush back home to our little corner of the world. On the right is the color palette the girls choose from at the orthodontist for bands. Josey picked the teal color to match her formal dress for this weekend. 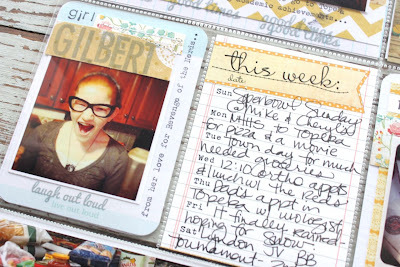 Here I used 2 Project Life Clementine journaling cards for the bases then embellished with Elle's Studio day of the week accent, a stamped sticker and a stamped label. Tip: when you use this "place" stamp from MME, remember that the place doesn't have to refer to a location on a map. I used "on the floor" to remind us that Josey is always on the floor at BB games. You could use "over the moon", "our happy home", "in the car", etc. 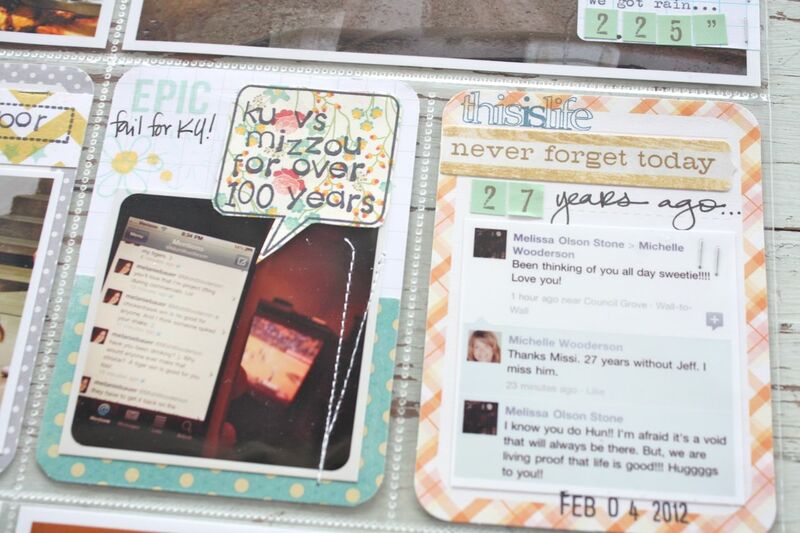 The last of my inserts include a photo of ongoing text messages that went on between Melanie Bauer and I during the KU/Missouri game. A little bit of fun razzing made the game so much more entertaining. I used a quote stamp from Studio Calico and stamped my journaling inside with the Hero Arts letters. On the right is a screen shot of a Facebook message from a friend. It was the anniversary date of my brother's death...so nice that she remembered and sent me a note. 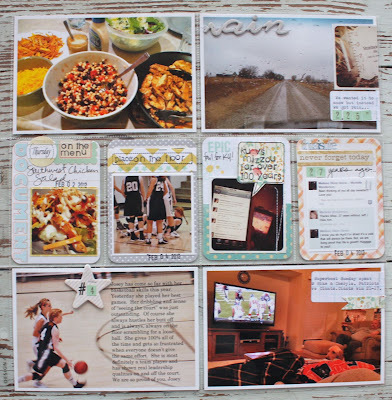 And here are my 4 x 6 inserts. More stamped letters at the top and flowers stamped on the right. The "fun" sticker is from Dear Lizzy's new collection. 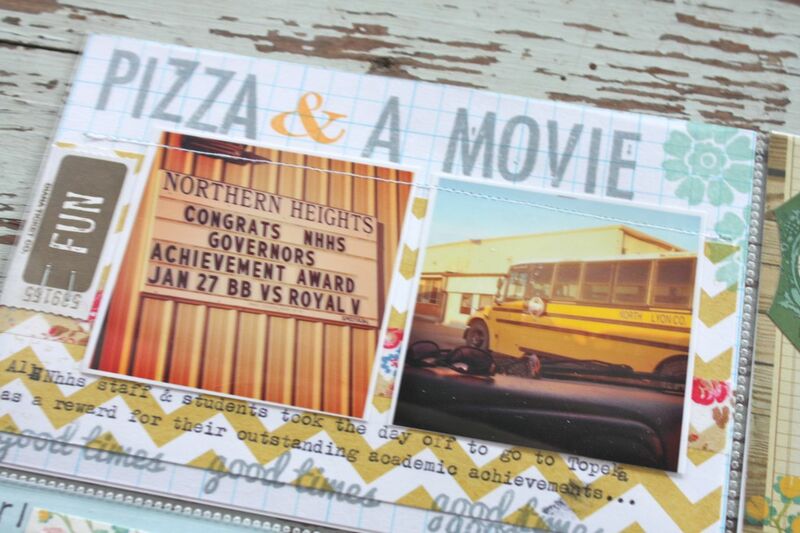 This was a fun day for Josey as the whole student body & teachers got the day off for pizza and a movie. The students earned a Governor's Achievement Award so it was a very big deal for the high school and our community. Here's 2 photos of the reds. 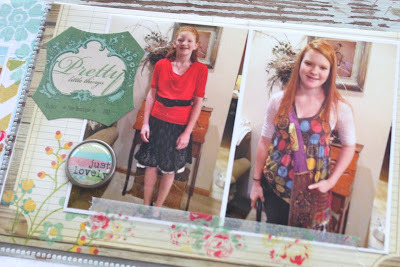 Jordan in a new dress up outfit and Josey sporting her hippy purse. Sticker is from....uh well, I can't remember now.......brad is from MME. Background paper is from MME, love that wood grain with the flowers. Flowery Washi tape is on the bottom. Here's a photo of my groceries on the counter at the store. Lots of my tweeting & hometown friends have been talking about the cost of groceries these days. 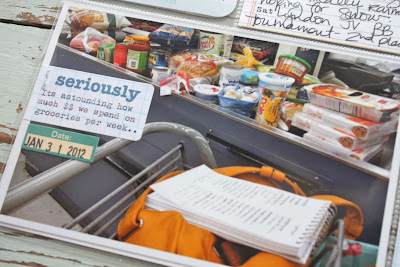 I thought the "seriously" stamp from Studio Calico was just perfect. I also used my vintage typewriter and my printed grid labels. Date sticker is from October Afternoon. 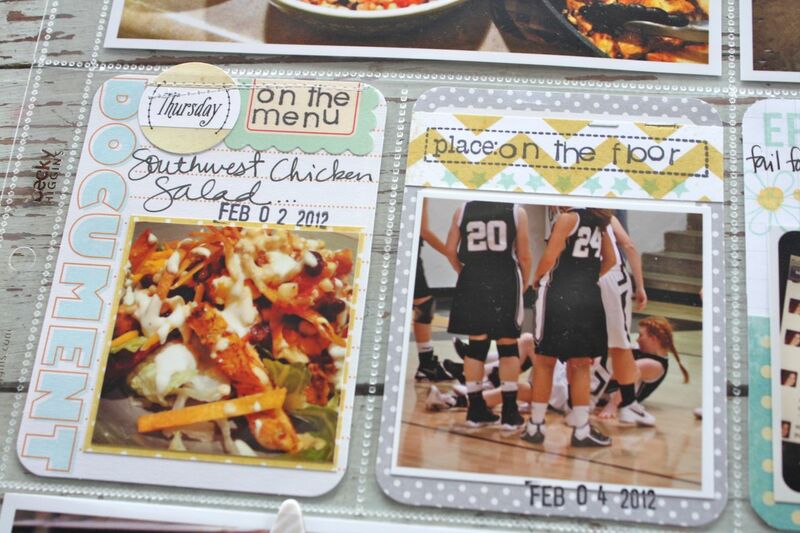 As a scrapbooker, do you get "the look" from people when you snap photos in odd places? Ya, I thought so. Here we are at the orthodontist. The girls didn't know I snapped these photos...very easy to do when you turn the iPhone on mute and act like you're checking messages. 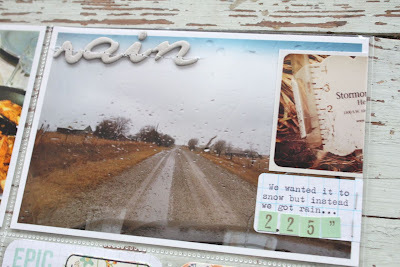 I used an Elle's Studio journaling tag with typewriter journaling + I stamped file folder labels that were punched from Jenni Bowlin's new punches. Love that punch! There's also some Washi tape and a border sticker under the photos. The grid background 4 x 6 card is from a little pile I printed to have on hand. Well it finally rained. We wanted snow but were in desperate need of some kind of moisture so we took the rain. I took this while stopped to get my mail. I used a typed grid label + a smaller Instagram that shows my rain gauge. The chipboard letters were from a Studio Calico kit and were stitched on with my sewing machine. 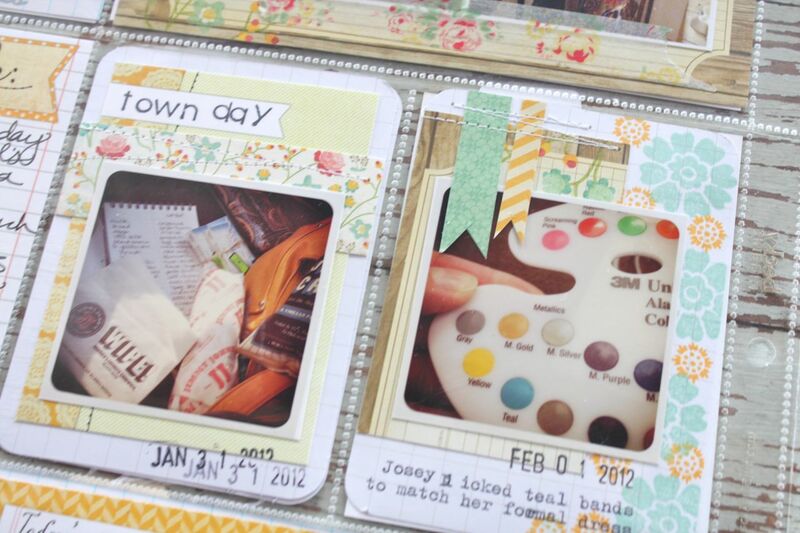 This insert shows something new I tried this month. 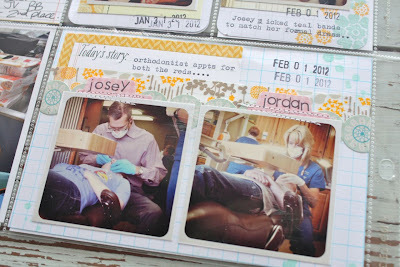 I knew I wanted to journal quite a bit about Josey so I opened up a photo in Photoshop that had a lot of blank space. I typed right on the photo using the text tool, then saved and printed my photo. And that is about the extent of my Photoshop skills, friends. 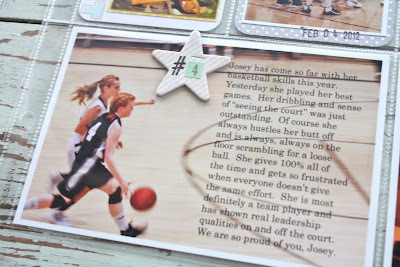 I'll definitely be using this technique again as it's a great way to add a lot of journaling but still get the whole image of the photo. Would be great on larger photos too like a 5 x 7 that could be included in an insert. And that's it for Week 5. I'm planning on taking lots of photos tomorrow for Josey's big formal dance event. 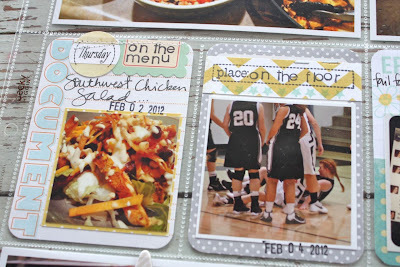 Am thinking it will make for a great Day in the Life page like Ali Edwards did this week. Okay, I'm off to work on some Papertrey projects and write out all my fun Valentine cards so I can mail them off. Have a great day and fantastic weekend! love, love, LOVE how you included that photo of us bantering and the tv in the background. definitely made the game even more fun! 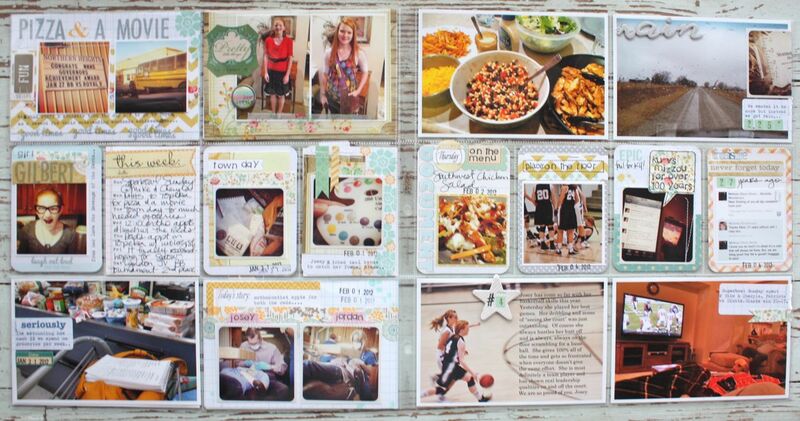 Thanks for all the inspiration you provide on Project Life! I love stopping by your blog... it's full of great tips, ideas and just good ol' happiness! P.S. Your layout in the current issue of CK magazine is beautiful!! I don't know where I have been but have only recently heard about PL and as a scrapper am constantly feeling the pressure to keep up. The products are now available to order in Europe and I can't wait to get my hands on them. Your PL is inspiring so thanks for sharing! 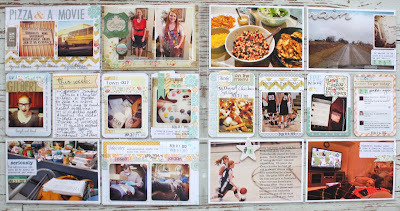 I just love your PL layouts! I am keeping up but feel a little lost this week, but once again you have inspired me with your layout and I am on track again. Thank you for all your help you are fantastic inspiration, great tips and I love to visit the blogs that you suggest. Great pages today! I love how you secretly snapped pics of your girls at the ortho office. I, too, had an ortho appt this past week, and I had my tech snap pictures of the procedure I was having done. I'm so happy I did, too! I'm learning not to be afraid to ask people to take pics of me. I also know what you mean about the "city headache." I live out in the "country" (I use the term sparingly), and the big city is almost 2 hours from me. I call it "land of the crazies." LOL! I always look forward to coming home, that's for sure. Hi, I just happen to stumble upon your blog. What brand and type of photo paper do you use? Do you buy those plastic sheets on Amazon? Thanks in advance! 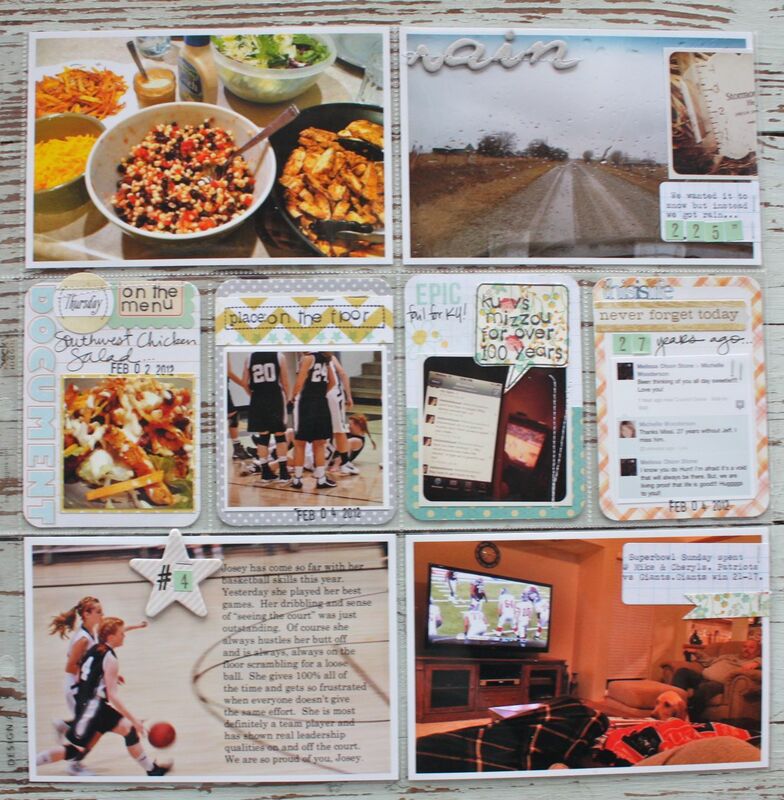 Hey Michelle-just stumbled on your blog through Pinterest and I absolutely love your take on Project Life. I pinned several of your ideas. I didn't think I needed the Miss Caroline Line from MME but you changed my mind! Have a great week!